Kashan county, in Iran’s central Isfahan province, is a monochromatic landscape of gracefully arched, khaki-colored buildings spread on dusty hills. Each spring, this desert region bursts into bloom, the hills filling with delicate pastel and deep pink roses in seas of green. 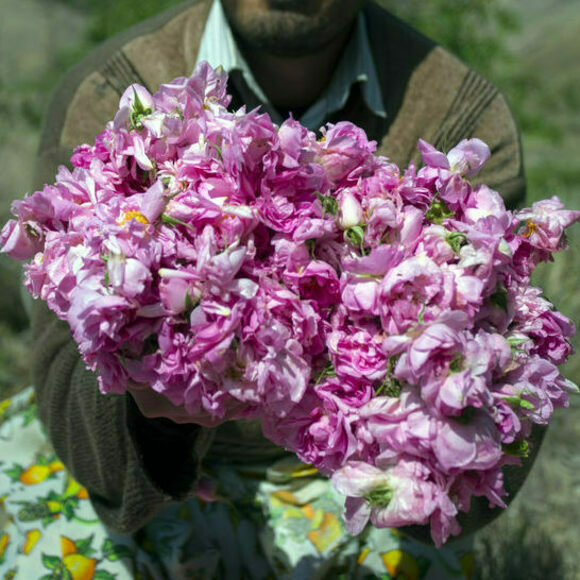 From May to June, local workers carefully wade through the thorny bushes of the region’s gol Mohammadi, or Mohammadi rose, picking thousands of pounds of the flower to distill into rose water. Visitors from across Iran and the world pour into the otherwise sleepy city of Qamsar to celebrate the fragrant harvest. While some of Qamsar’s rose water manufacturers have switched to industrial methods, many local producers distill the liquid using a centuries-old process, called golab-giri. Distillers pour up to 65 pounds of the petals into copper pots, mix them with water, cover the copper with clay vessels, and boil the mixture for hours over a low, steady flame. The steam floats into thin tubes attached to the pots before condensing and flowing into pitchers. This fragrant distillate yields both rose oil, a highly concentrated liquid prized for its perfume, and rose water, which is less expensive and often used in food or for medicinal purposes. Visitors can find bottles of rose water, fragrant rose sweets, and barrels of the roses themselves available directly through traditional manufacturers in Qamsar itself, or in the nearby city of Kashan’s central bazaar. Besides flavoring classic Persian sweets such as faloodeh, distillate from the flower, called the rose of Damascus outside of Iran, is used in traditional medicine to treat everything from sore throats to heart disease. Contemporary Iranians often credit the 10th-century Persian doctor Ibn Sina, known in the West as Avicenna, with the invention of rose water distillery, though it’s likely that distillery methods predate him. Either way, Mohammedi roses and their fragrant distillate have been inspiring Persian writers for generations. 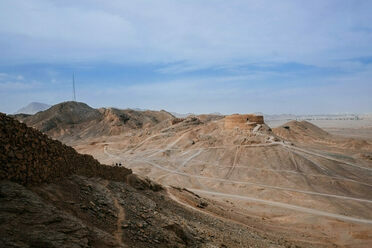 So why not heed 14th-century Persian poet Hafez’s advice to “tend to pleasure while the rose blooms,” and plan a trip to Qamsar for the festival? Persian rose water is so prized, it’s often used alongside water from the holy Zamzam well in the biannual ceremonial washing of the sacred Kaaba, a square shrine inside Islam’s most sacred mosque in Mecca. The rose water manufacturing center has been converted into a museum of the craft. It is located next to the Jaame masque, on Saheli Blvd. This harvest celebration culminates in a procession of drummers, palanquin-riding leaders, and vibrant colors. These Mexican bugs taste like cinnamon and alleviate arthritis pain. These buns artfully resemble peaches and represent immortality.